I was recently challenged to come up with a unique ballpark hot dog that would represent me and/or my region. Well, I'm always up for a good culinary challenge, so I present The Spud Dog. This dog starts with a hoagie roll lined with melty cheddar cheese. Then I pile on some freshly made fries, caramelized onions, a grilled Kosher beef hot dog, sauerkraut and ballpark mustard. The inspiration for this dog comes almost equally from me and my region. Of course Idaho is most known for our potatoes (we even have "Famous Potatoes" emblazoned on our license plates), so the fries were a given. We also produce our fair share of dairy and beef, including the famous American Wagyu beef from Snake River Farms. The personal part of the inspiration is the onion, kraut, and the name. I was raised eating my German maternal grandmother's sauerkraut and pork which includes wedges of onion that steam and lightly caramelize as it cooks. As for the name, my wife called me "Spud" when we first met, as I was in Idaho and she lived in SoCal. My usual testers, the ladies of the house, gave this serious props. Let me know what you think. Start your grill and grill the hot dogs to your liking. While the dogs are cooking, split the rolls horizontally about 3/4 of the way through. Line each roll with two slices of cheese, add an equal amount of fries to each, and heat them under your broiler until the cheese is just starting to melt. 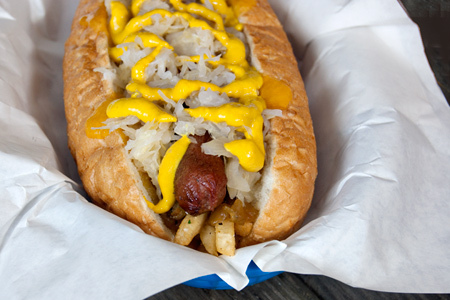 Smear an equal amount of caramelized onions on top of the fries, add the grilled hot dog, cover with an equal amount of sauerkraut and mustard to taste. Wow!!! What a great combination - sounds totally awesome. Will definately be trying this loaded dog!Getting ready to Ziplist and Pinterest this recipe. Thanks a million!!!!! I'm full from just LOOKING at that behemoth! Great dog, John. Good looking dog... I went to school in Pittsburgh, where they're famous for slaw and fries on cheesesteaks; this looks even better! Yum Yum, reminds us of the little mom and pop stores we visit that serve chili dogs !